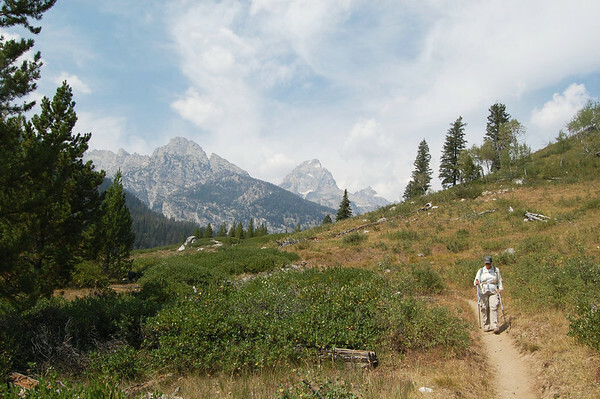 Today we did our first two hikes in Grand Teton National Park. Unfortunately, smoke from area forest fires caused a haze over the mountains, but the hiking was still enjoyable. 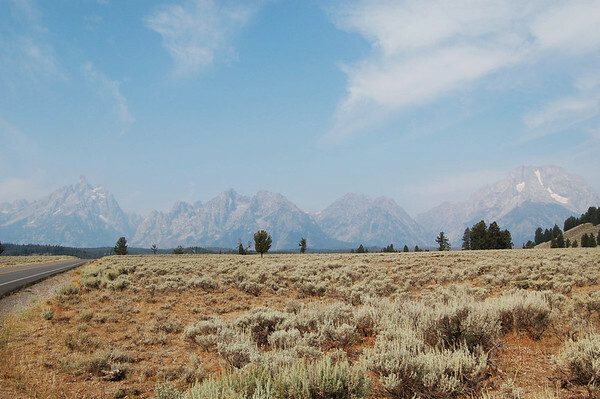 We arrived in the Grand Teton National Park area a few days ago, but heavy smoke from forest fires sent us to explore Yellowstone National Park first. 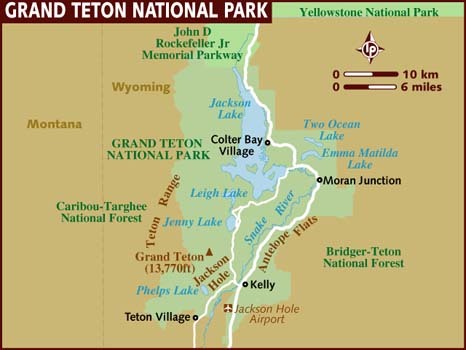 Grand Teton is located directly south of Yellowstone in the northwest corner of Wyoming. 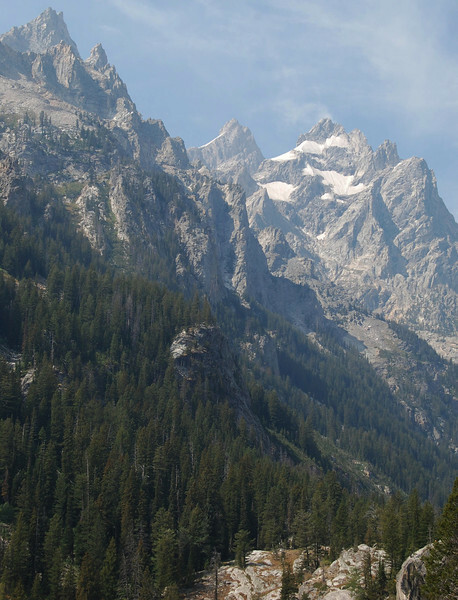 It was our first visit to both parks, and it was a shame that the smoke had the Teton Range in a haze. 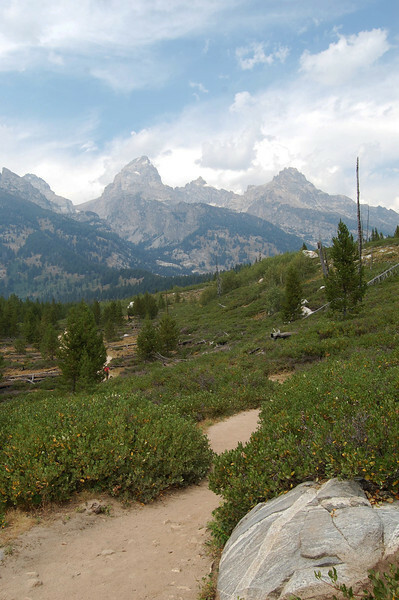 But today, we decided to do some hiking in Grand Teton anyway. 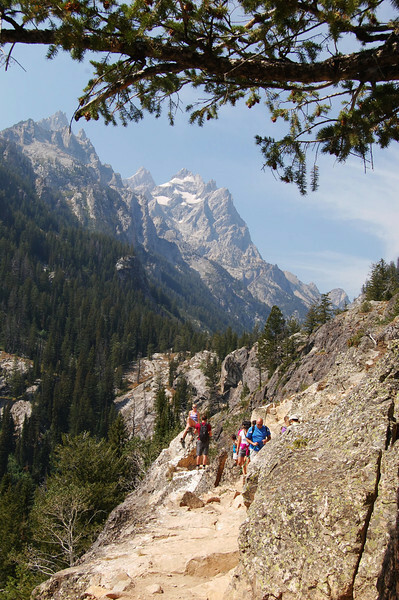 Grand Teton & Yellowstone have so much hiking, it's hard to choose which hikes to do. 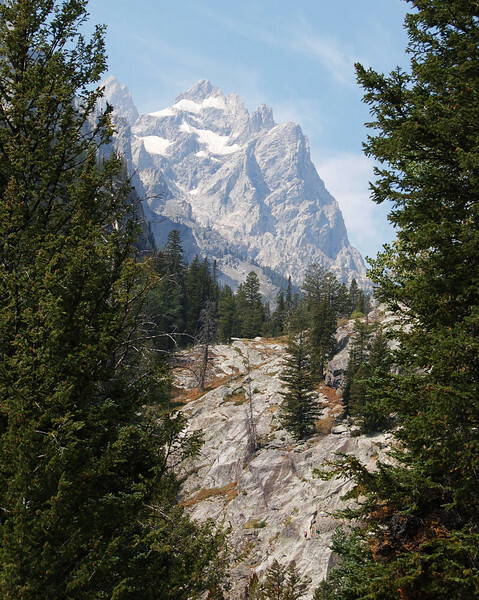 We headed into Grand Teton armed with the Day Hike brochure and the Lakeshore Hikes brochure from the park website. 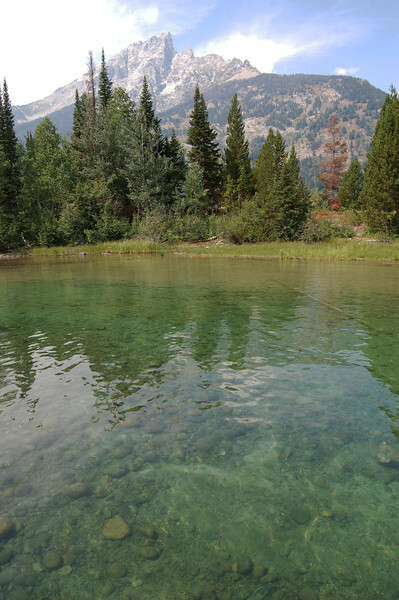 There are seven large lakes at the foot of the Teton Range and a few more smaller lakes. 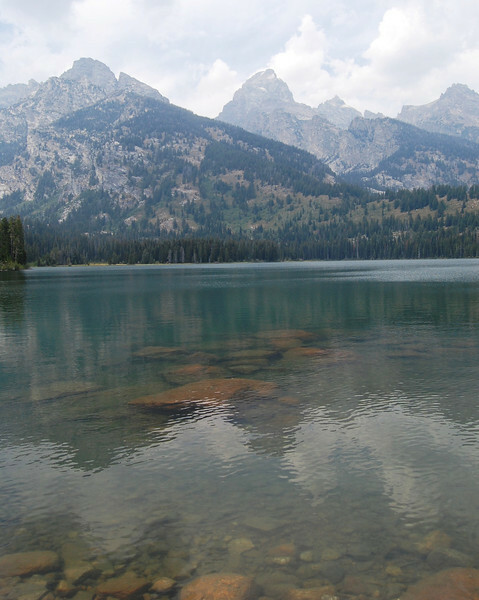 So, the there are numerous hiking options with lakes and mountains as part of the view. 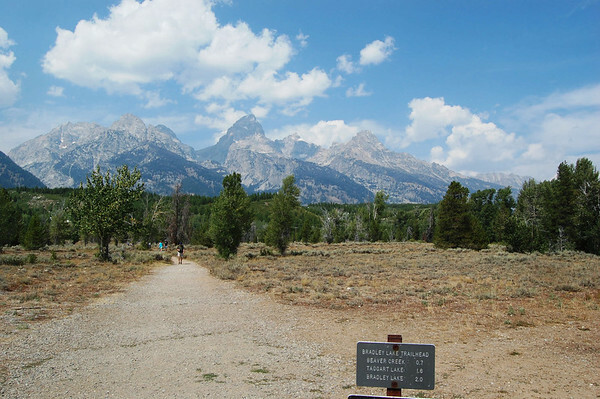 Note that parking is limited at the trailheads, and if you don't get there early you may have to have an alternate plan. 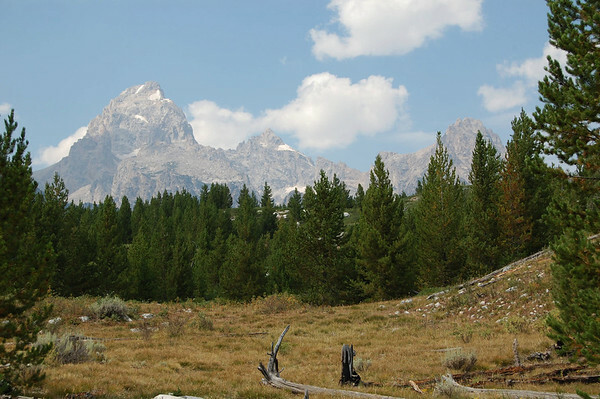 Grand Teton is a small park at 310,000 acres compared to its huge neighbor Yellowstone at 2.2 million acres. The road we are camped on is about three miles east of Moran Junction which is shown on the map, center right. Today we explored the inner park road which is the left side of the oblong loop. On the way to the first trailhead, we stopped at a couple of turnouts to get photos of the mountains. It's still smoky, but this might be as good as it gets while we're here. It gets better as you get closer, but there's still a haze. 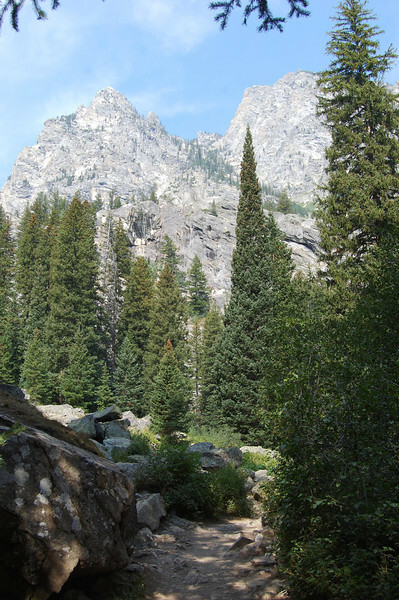 Today, I decided we would knock out one of the most popular hikes in the park - the Hidden Falls/Inspiration Point hike. 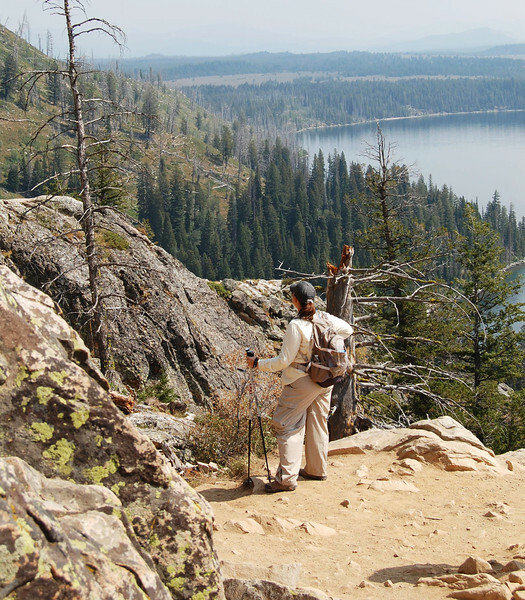 You have two options for this hike. 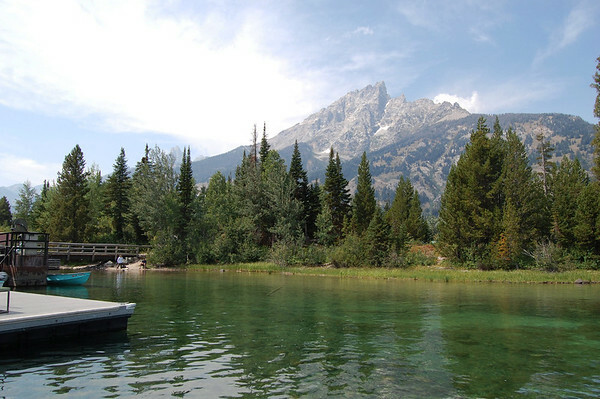 You can walk half way around Jenny Lake to the trailhead, or you can take a boat shuttle directly across the lake to the trailhead. 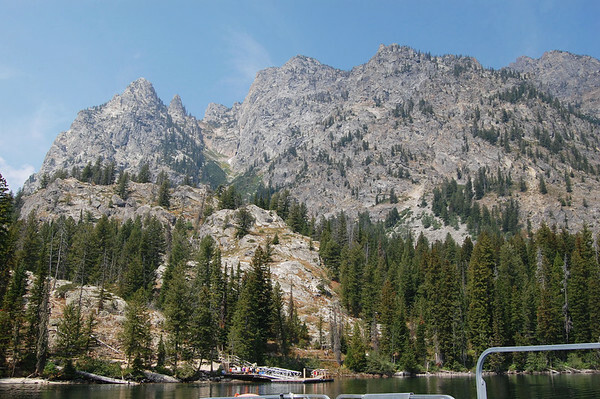 Taking the shuttle with Jenny Lake Boating costs $10 each roundtrip, but it knocks off four miles of hiking. Since we wanted to do multiple hikes, we cheated and took the shuttle to save time and our legs. 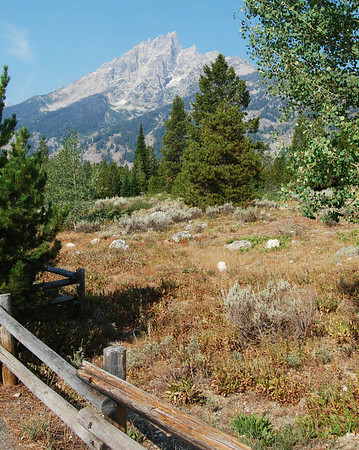 The parking lot at South Jenny Lake was already three quarters full when we arrived. But we got a spot and walked the paved trail toward the boat dock. The boats run every 15 - 20 minutes and, though there are often long lines, we walked right on after paying our fees. The water was crystal clear in the boat dock area. We sat on the "wrong" side of the boat on the way over. 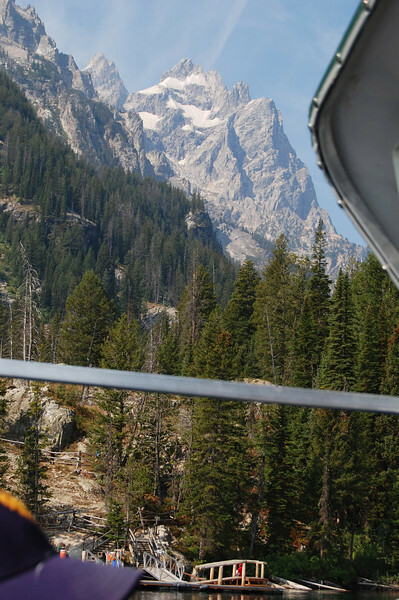 You want to be on the left for mountain views. But I got one shot as we approached the dock at the trailhead. Looking back down at the dock after disembarking. 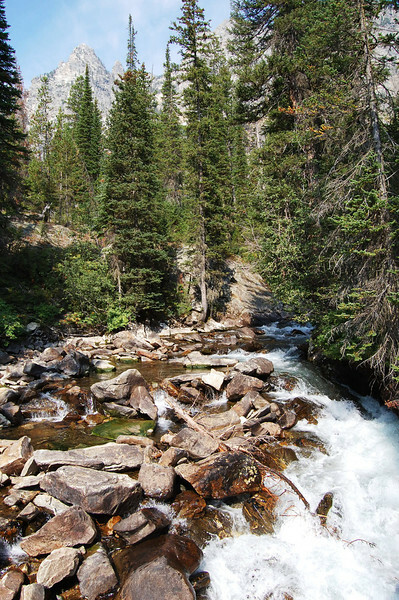 It's a half-mile hike to Hidden Falls. 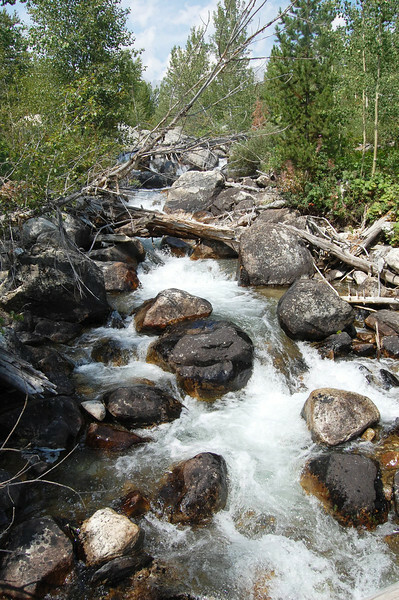 The hike is pretty easy although the trail is rocky, so sturdy shoes are recommended. If you are the type that doesn't watch where you are stepping, shoes with ankle supports are better. 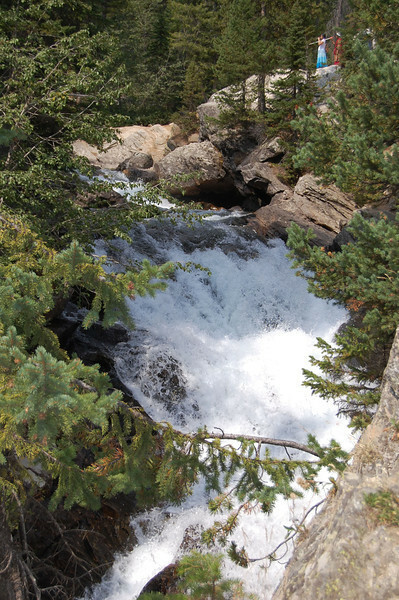 We walked along a rushing stream during the gentle ascent. 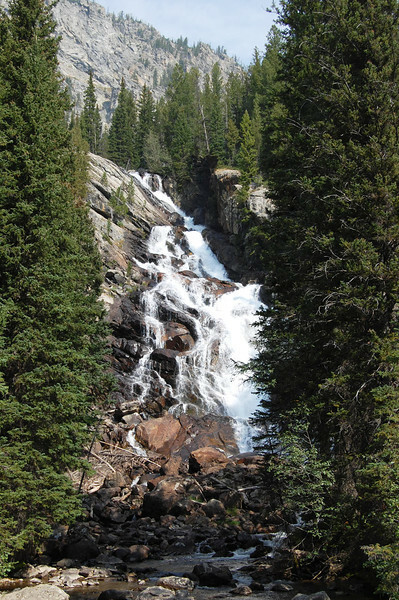 Soon, we arrived at Hidden Falls, a lovely 200-foot cascade. But it is hard to sit and enjoy it. The trail deadends in a little "corral" where there are just a few places to get good photos. If folks linger too long, the viewing area just keeps filling up as more people arrive. 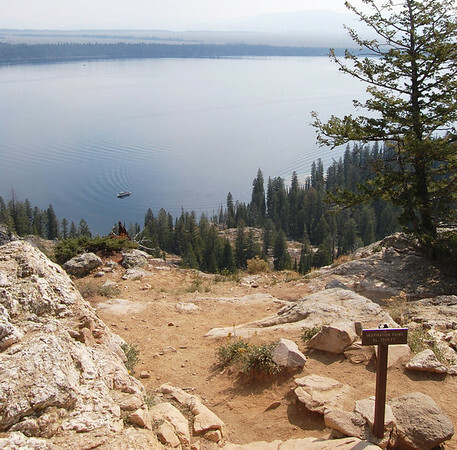 So, after seeing the falls, you can return to the boat making it a one-mile roundtrip, or you can backtrack about 100 feet and continue on the trail to Inspiration Point which is another half-mile farther. That half-mile is a bit more strenuous as it is a steeper, rockier climb. But, at 7200 feet, the views are worth it. I climbed up on some rocks for better views while Linda scanned the area for a good place to have lunch. Beautiful, even with the smoke. A little zoom in on the snow and ice patches. After having our lunch overlooking the lake, we headed back down. 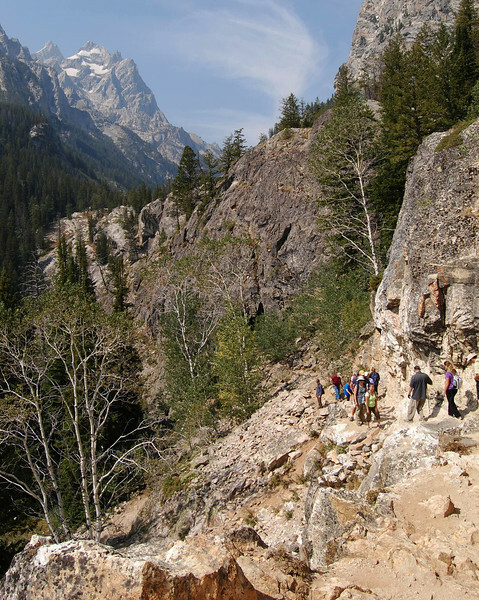 From Inspiration Point, there are several hike continuation options of varying lengths up through Cascade Canyon. But this two-mile round-tripper was enough for us as we had more hiking in mind for the afternoon. Here are a couple of nice shots of the trail as we descended. On the way back to the boat dock, we took the alternate route the last 200 yards. That path provides a good look at another waterfall. A boat was ready and waiting at the dock. 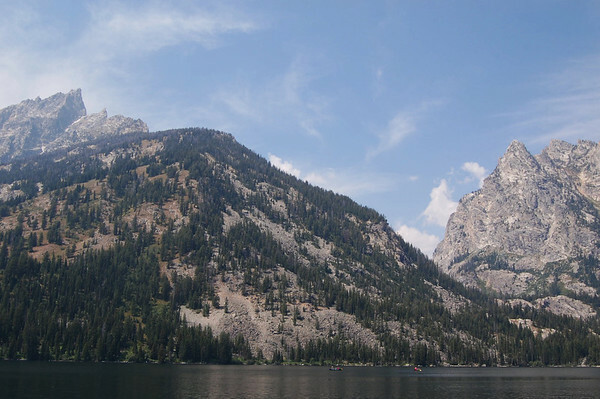 And soon we were one our way back across Jenny Lake with the mountains behind us. I sat on the "correct" side of the boat this time. One last shot as we approached the dock. Though crowded, it's easy to see why the Hidden Falls/Inspiration Point hike is popular and we were glad we started the day with it. When we left the rig this morning, Linda said "I don't want to hike more than six miles". Since we had only hiked two, I had another four in reserve. I had a couple of choices, but decided on the Taggart Lake hike with a return to the parking area along Beaver Creek. That would be a 3.9-mile loop and keep me under the six mile limit. We drove south to the trailhead and were lucky to get one of the remaining two or three parking spots. Soon, we were off with a few groups of others. and increased elevation slightly on the wide trail. 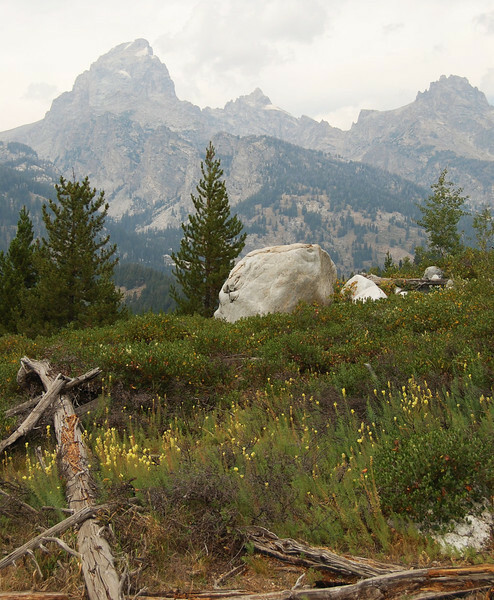 We crossed a meadow that had large white rocks scattered about. And there are some yellow wildflowers in bloom. 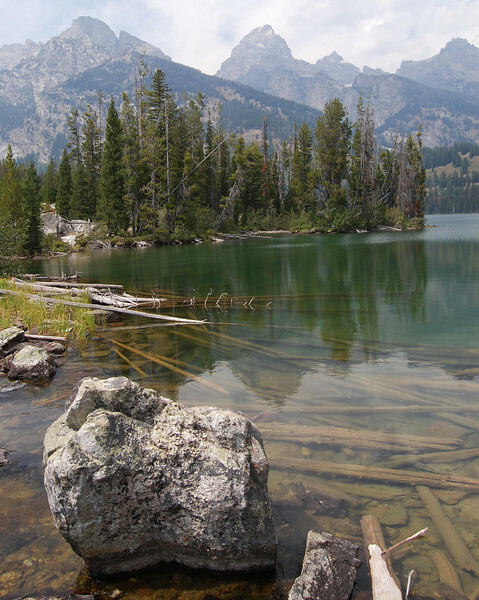 But the real beauty of this hike came when we reached Taggart Lake after a mile and a half. It sits at 6900 feet. 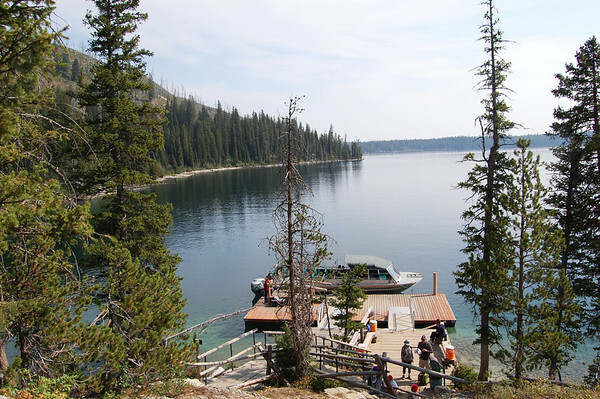 This lake is prettier than Jenny Lake and we'd love to paddle it if there was easier access. After admiring the lake for a few minutes, we had the option of returning the way we came for a 3-mile roundtrip, or we could continue to the south taking 2.4 miles to get back to the parking lot. We chose the long route. Once across the bridge, the trail narrowed as we made a short climb. From that point on, we didn't see another person. Nice. After reaching the summit of the trail, we descended into a valley. At the bottom, was a small creek. With no people and a water source, I was sure we would see some wildlife. The habitat looked perfect and there were several game trails that crossed the path. But other than squirrels and chipmunks, we didn't see anything. Eventually, we climbed up from the valley a little bit and the mountains came back into view. We were getting tired as we neared the end of the trail, so the parking lot was a welcome sight. 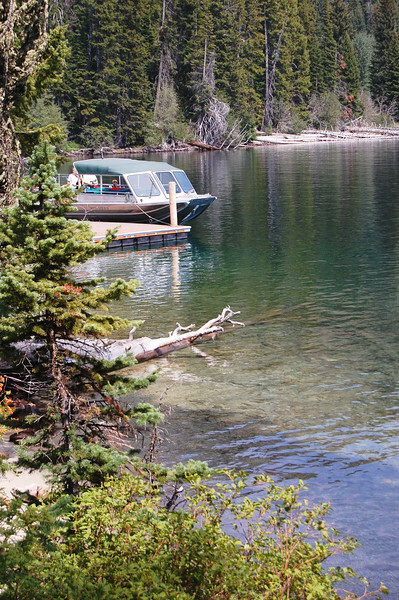 But Taggart Lake is worth the hike, and you can add a couple more miles and go to Bradley Lake as well. But for today, we were finished with the hiking. 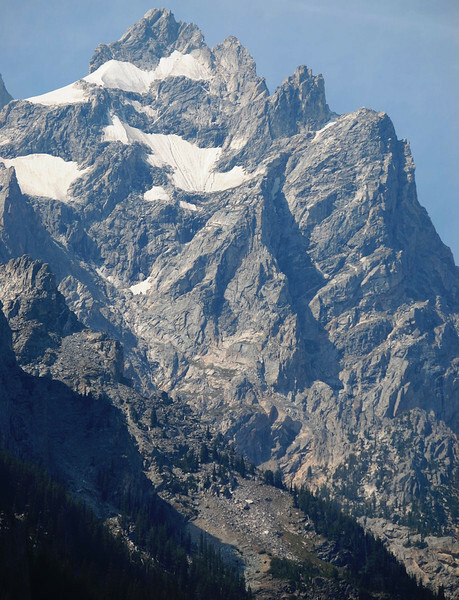 It was a good start to our Grand Teton exploring.